Late in the seventh game of the 1925 World Series, Washington Senators manager Bucky Harris faced a season-defining decision. Starter Walter Johnson was a few weeks away from his 38th birthday, and, while he’d won Games 1 and 4, he was no longer the workhorse he’d once been. With Johnson laboring and the Senators’ lead slipping, Harris could have summoned Firpo Marberry, a proto-relief ace who led the majors in appearances, games finished, and (retroactively calculated) saves in each season from 1924 to 1926. Marberry had saved Game 3 and finished Game 5, and he was rested and ready. Instead, Harris chose to stick with his starter, who allowed five runs over the final two innings to drop Game 7, and the Series, to Pittsburgh. Are Hitting Prospects Worse Off? Click here for more MLB Preview! Eighty-nine years later, another manager of a 96-win Washington team had to choose between a top starter and a fresh reliever with a playoff game on the line. In Game 2 of the 2014 NLDS, Nationals manager Matt Williams called for closer Drew Storen to replace Jordan Zimmermann, who had held the Giants scoreless for 8.2 innings before walking Joe Panik, who represented the tying run. Storen allowed a Buster Posey single and a Pablo Sandoval double, erasing the one-run lead. Nine extra innings later, a Brandon Belt home run broke the tie to give the Giants the game. Williams was criticized for not trusting his cruising starter to get one more out — for, essentially, not relying enough on sentimentality. Second-guessing coaches is a constant in sports: No matter the move or the millennium, managers get criticized when their players don’t perform. In the context of their eras, though, what Harris and Williams did was fairly foreseeable. Johnson, even at an advanced age, threw complete games in more than half of his outings in 1925; Zimmermann finished only three of his 32 starts in 2014. That’s why Williams went to the pen when Harris did not: In the decades between the two games, teams discovered the benefits of calling in the cavalry. A fresh reliever doesn’t suffer from fatigue. He doesn’t have to pace himself. And maybe most important, the hitters he faces haven’t already seen him in the same game. All pitchers play poker, but some have better hands to begin with, and some go to greater lengths than others to hide what they’re holding. Let’s see what we can learn by taking a peek at their cards. On the outside, most starting pitchers look the same in the sixth inning as they do in the first — sweatier, maybe, but otherwise unaltered. Most fans’ perceptions of a pitcher’s true talent are just as static: We think an ace in the first inning is still an ace at the end. But by the third time through the order, the pitcher who took the ball at the beginning of the game is gone, replaced by a much less effective facsimile. This shows up in the stats when we compare starting pitchers’ splits by times facing hitter using True Average (TAv), a Baseball Prospectus statistic that measures park- and league-adjusted offensive performance on the batting average scale, where .260 is the league average. Last season, 104 pitchers worked exclusively as starters and threw at least 100 innings; the table below shows the collective True Averages they allowed in their first, second, and third times facing the same hitters in the same game. The third column lists a starter whose full-season TAv allowed matches the split listed for the whole group in the second column. In their first time facing a given hitter, our starters, as a group, pitched like full-season Stephen Strasburg. The second time they matched up, batters did better, hitting roughly like they would against a league-average arm. By the third time they faced the same hitters, the pitchers who’d been dominant a few innings before were worse than average, allowing opponents to hit like the league did against Dan Haren.1 We’re focusing on a sample of pitchers selected for their ability to go deep into games, weeded out from thousands of other pitchers who stalled in the minors or shifted to the bullpen because they couldn’t make it through lineups multiple times. And even so, we see a dramatic decline in effectiveness as the game progresses. Research has shown that this “times through the order” effect — or more accurately, in this case, “times facing hitter” effect — penalizes every pitcher to some degree. Great pitchers the third time through are better than average pitchers the third time through, but only because they start from a higher peak, not because their declines are more gradual. That means that when we’re managing at home (or, in one man’s case, when we’re Matt Williams), we have a mental adjustment to make as the game goes on. 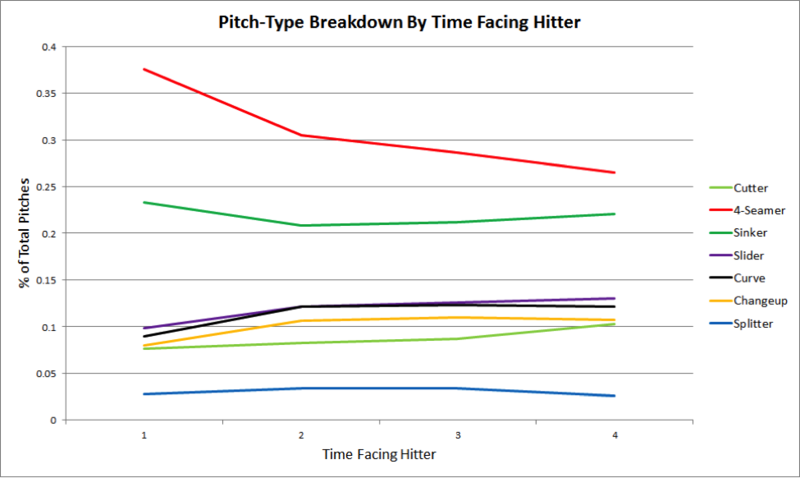 It seems reasonable to assume that the “times facing hitter” effect would have something to do with a deterioration in stuff, and it’s true that some pitchers consistently lose velocity as their pitches pile up. The following leaderboards list the pitchers last season with the biggest gains and declines in average four-seamer velocity from their first trip through the order to their third, according to PITCHf/x-based pitch-type classifications provided by Pitch Info. 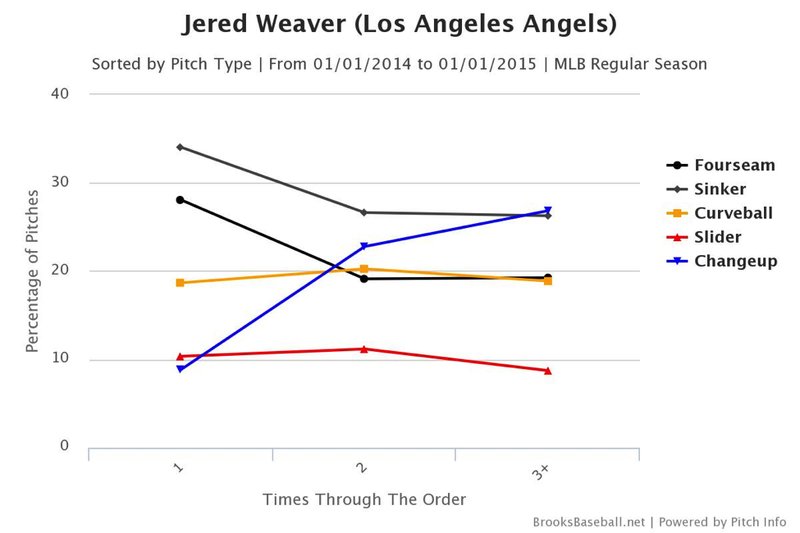 Velocity loss (and corresponding declines in pitch movement) can’t explain all, or even most, of the times-facing-hitter penalty, though: Even Cueto pitched worse against third-timers last season, and Justin Verlander, who’s long shown a tendency to throw harder as games go on, has also fared worse in his third time facing hitters. Moreover, our 104 full-time starters lost only 0.22 mph, on average, from their first lineup transit to their third. The times-facing-hitter penalty isn’t as much a fatigue effect as it is a familiarity effect that compounds as hitters have time to study their prey. You’ve probably heard broadcasters talk about the importance of “establishing the fastball early,” which supposedly gives the pitcher the freedom to mess around later, like kids who’ve done their homework and are finally free to play. This is what that looks like: The general trend is toward fewer fastballs and more breaking balls and off-speed stuff later in the game. Use of the four-seamer sinks with each repeat encounter; the sinker rate drops off initially, then rises slightly, probably because pitchers who are approaching their pitch limits try to economize by getting ground balls. No pitcher’s pitch-mix progression is exactly the same as another’s, but “throw fewer fastballs” is close to a hard-and-fast rule. Among our 104 starters, only Rays rookie Jake Odorizzi increased his rate of four-seamers plus sinkers from his first time facing hitters to his third. The Rays starter turns 25 on Friday, and a stat about his pitch-type distribution today is just a snapshot of a single point on his developmental timeline. Those tendencies will likely evolve in his second full season. But that might change as he becomes more comfortable in his ability to throw off-speed stuff for strikes. The righty converted his old changeup into a more effective splitter last season, and he threw the new pitch almost a quarter of the time. He’s working on refining his secondary stuff this spring, and as he matures, his four-seam percentage could continue to fall. Sooner or later, he’ll likely conform to the typical pattern and look more like every other member of Fastball Establishers Inc. While the table above tells us which pitchers alter their fastball usage as games go on, we can come up with a more holistic stat to assess in-game adjustment. To pick out the pitchers who shape-shift the most, I summed the absolute values of each player’s changes in each pitch-type percentage. In words that make more sense, I took the differences between each pitcher’s first- and third-time four-seamer percentage, sinker percentage, slider percentage, and so on, and added all of those gaps together. 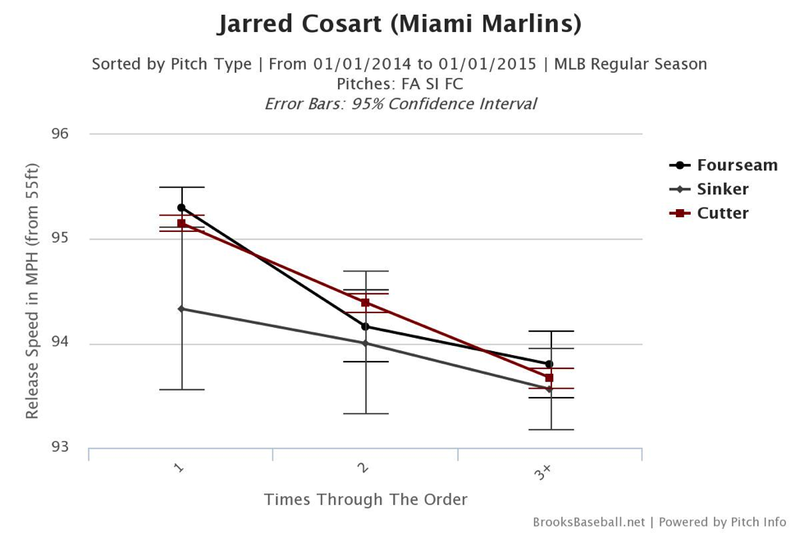 The result is a quick-and-dirty total that tells us how different each pitcher’s mix looks in the later innings. The higher the number, the less a starter’s pitch distribution in his third time facing a hitter resembles his distribution two in-game matchups earlier. The biggest mixers make sense. There’s Doug Fister, the soft-tossing righty who has six pitch types to choose from, and there’s Darvish, the hard-throwing righty who has an unfair eight pitch options — or did, before his UCL snapped and stole them all away. On the other extreme end of the mixing spectrum, there’s R.A. Dickey; Brett Oberholtzer, about whom you now know at least one thing; Odorizzi; Travis Wood, a 28-year-old who throws some sort of fastball more than 80 percent of the time; and Bartolo Colon, a 41-year-old who throws some sort of fastball more than 80 percent of the time. On the left-hand leaderboard, there’s the 2014 AL Cy Young Award winner and the 2013 AL Cy Young runner-up; on the right-hand leaderboard, there’s the stick figure who’s finished in the top six in AL Cy Young voting for the past three seasons. Rotations contain multitudes, and mixing isn’t always a must. Nor is it a surefire way to fool hitters. In fact, Fister, the master pitch-mixer, allowed a .200 TAv in his first time facing hitters last season, and a .315 TAv in his third-time matchups. Weaver’s TAv allowed ballooned from .230 in his first face-offs to .321 in his third. You’d be right to sound the small-sample siren here: How a pitcher does in 200-300 “third-time” plate appearances in a single season tells us next to nothing about whether he’s well- or ill-equipped to go deep into games. But we can try to get a clearer sense of the characteristics that lead to starting-pitcher staying power by dividing our 104 arms into two groups: those with top-heavy repertoires and those with well-rounded ones. 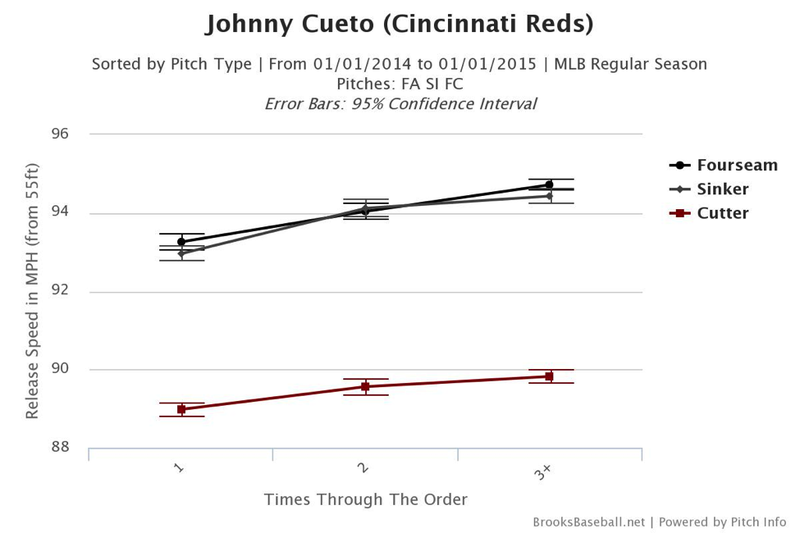 As a proxy for repertoire well-roundedness, we can use the standard-deviation of each starter’s pitch-type percentages, a measure of how closely clustered his pitch-usage rates are around his mean pitch-type percentage. Take Dickey, for example: His pitch-type percentages are either in the high 80s (the knuckleball) or the single digits (everything else), so none of his individual pitch usage rates is anywhere close to the average of all of them. That gives him the highest standard deviation and, by this definition, the least evenly distributed repertoire. Aside from Dickey, the less balanced group is best represented by young flamethrowers Kevin Gausman and Danny Salazar, who throw four-seam fastballs nearly 70 percent of the time. The more balanced pitchers, on the other hand, don’t rely very heavily on any one pitch: Think Masahiro Tanaka or Cueto, neither of whom throws any one pitch as often as 30 percent of the time — or, for that matter, consider self-described poker player Peavy, who shows up as the 10th-most-balanced pitcher out of 104. I sorted the group of 104 by “balance” and then split it into two groups of 52. The less balanced group, on average, was almost two years younger, which makes sense: Dickey notwithstanding, pitchers generally become more balanced with age, as they refine their secondary offerings and lose velocity, forcing them to compensate with softer stuff. In their third encounters with hitters (a sample slightly larger than 10,500 plate appearances), the less balanced group allowed a .274 TAv, 29 points higher than their first-time .245. In roughly the same number of plate appearances, the more balanced group allowed a .264 TAv, only 17 points higher than their first-time .247. That’s not definitive, but it does seem to jibe with Mitchel Lichtman’s finding that pitchers with more top-heavy repertoires tend to suffer harsher in-game declines, presumably because it’s harder for them to take hitters by surprise. That doesn’t imply that pitchers with top-heavy arsenals and lousy secondary stuff should throw their best offering less often, just for the sake of being more balanced. Pitchers can’t force themselves to be Darvish or Fister: They have to weigh the upside of upsetting the batter’s expectations against the downside of neglecting their own strengths. Still, what we’ve learned supports the intuitive idea that, all else being equal, having more pitches to draw upon helps. The more cards a pitcher can play, the more likely he is to have one the hitter can’t counter. Thanks to Harry Pavlidis and Rob McQuown of Baseball Prospectus for research assistance, and to Jon Roegele and Noah Woodward for testing the waters. The fourth time, the starters allowed a .255 TAv, which seems to suggest that they got their second wind. But that’s a misleading stat: It’s not that starters get better in their fourth time through the order, or even that pitchers who perform better than expected through, say, seven innings continue to do better than expected thereafter. (They don’t.) It’s that the subset of pitchers who regularly make it through the order a fourth time is more skilled and/or durable than the subset that doesn’t. Adjust for the starters’ talent level, and the apparent rebound evaporates. Other factors, like colder temperatures in the late innings and poor batter performance late in lopsided games, also make the fourth-trip mirage more convincing. Though maybe they were just sick of him saying things. Wily Peralta’s slider rate increase of 10.2 percentage points in his second time facing hitters was the only other double-digit bump.